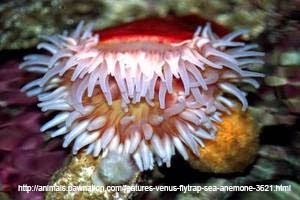 Actinoscyphia aurelia is an anemone (try pronouncing that) which is known as the Venus fly trap anemone. They look a bit like a venus fly trap. Much like a venus fly trap their fleshy lobes shut in order to trap their prey inside. When they are threatened they release some sort of slime which glows in the dark. I know, that doesn't sound like a particularly great defense to me either. We're not really sure what this is supposed to accomplish, but there are several hypotheses. 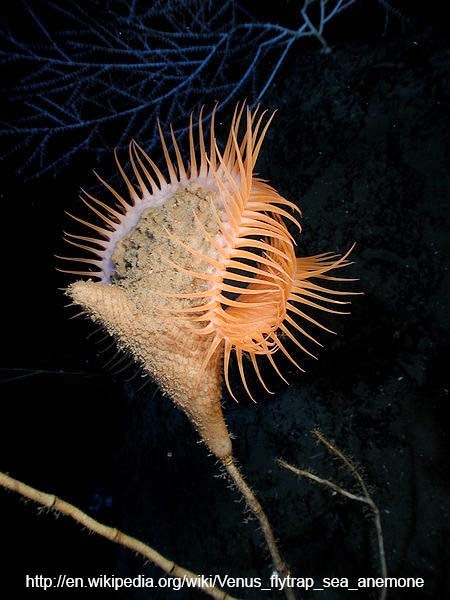 Venus fly trap anemones are found on the ocean floor at depths of over 1000 m in the Atlantic ocean, particularly the gulf of Mexico.